New technology improves your vision. Eyes on Broadway & Rexine Family Eyecare have the latest technology and professional services available to guide our patients from initial eye exams through follow up visits. New technology including automated visual fields, PHP for macular degeneration, Z-view and Optomap digital retinal imaging. Dr Rexine will refer you if necessary to the best ophthalmologist suited for your specific needs. 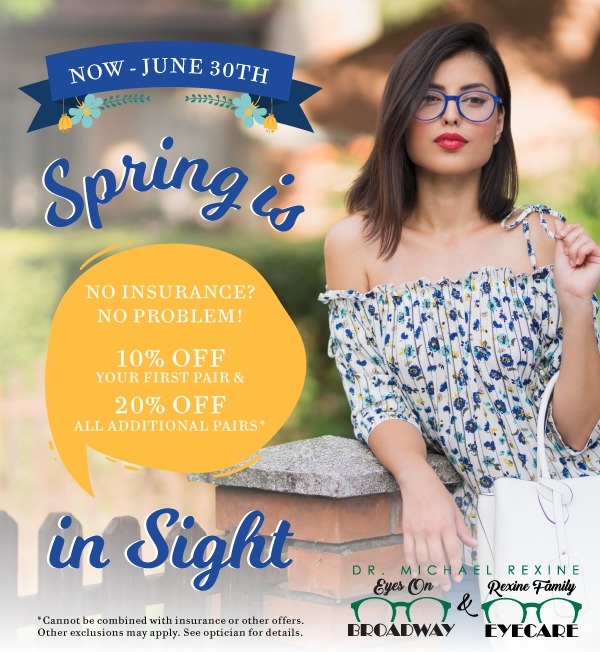 Eyes on Broadway & Rexine Family Eyecare have a full service optical with an ever-changing selection of eyewear from today’s top designers. If you want trendy and fun or quiet and understated, we’ve got a new look for you! Dr Rexine is able to fit all types of contact lenses on all types and ages of patients. If you have tried or have been told you can’t wear contacts, Dr Rexine will take the time necessary to fit you in contact lenses that will meet all your needs.